Just off the beaten path, Aimee is spotted taking a short rest from her sightseeing journey on her Springer. She rolls up her jeans and cools her feet by the waters edge. She soaks in the soothing sounds of the trickling waterfall, as she is warmed by the burst of sunlight that peaks through the leaves. A golden hue reflects off the flourishing green lilly pads. 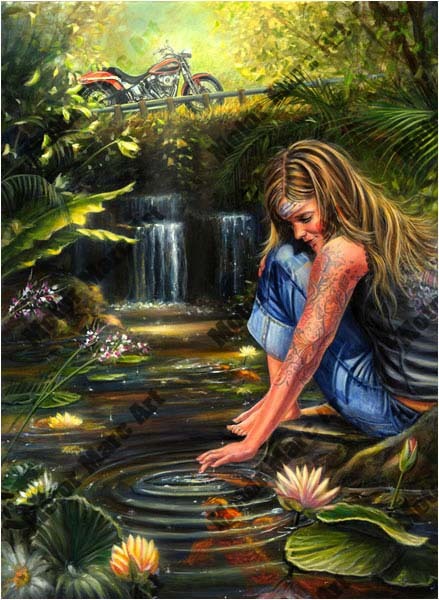 Aimee playfully grins while she teases the koi with her finger, as they swirl around the water lilies. A quiet repose in a moment of play.